The Tree Kangaroo Conservation Program (TKCP) began in 1996 as a conservation research study to determine the status of the endangered Matschie’s tree kangaroo. One of Papua New Guinea’s longest-running and most successful conservation efforts, TKCP works with local communities to establish and manage the YUS Conservation Area (YUS CA), named for the Yopno, Uruwa, and Som rivers, in Morobe Province. A Category VI IUCN Protected Area, the YUS CA is the first and only protected area of its type in PNG –providing protection at the landscape scale, wholly owned by local people, and with the support of the PNG Government for long-term protection. The Matschie’s tree kangaroo (Dendrolagus matschiei) remains the flagship species for the overall conservation program, while TKCP has expanded to support the needs of the wildlife, habitat, and communities throughout YUS. The YUS Landscape, consisting of land pledged for conservation as well as buffer areas of mixed use, encompasses over 158,000 hectares (390,000 acres) ranging from coastal reefs to 4,000-meter peaks. Nearly 70% of the YUS landscape is covered by a large unbroken tract of rainforest and home to a rich biodiversity of flora and fauna. TKCP’s community-based strategy helps provide benefits and improve the standard of living for the more than 12,000 people in 50 villages throughout YUS. Indigenous landowners and community members participate in TKCP’s work, including scientific research, land mapping, education, health, sustainable livelihoods, and conservation outreach activities. Under PNG’s unique land tenure system, more than 90% of all land in the country is held and controlled by customary landowners. As such, the sustainability of the YUS CA depends upon the commitment of the local landowners. TKCP is truly about empowering the local stewards of the environment. “The concept of conservation is not new to us. Traditionally, our village chiefs and elders were entrusted to be the stewards of the land; a great privilege and honor. Some of the land outside of our villages is declared off-limits, or ‘tambu’ – these areas are believed to be controlled by powerful unseen beings. Trespassers and their families will be cursed with bad fortune or death. These tambu areas then serve as reserves, regenerating and repopulating the entire forest. To manage the YUS Conservation Area, TKCP works closely with the YUS community and with PNG’s local, provincial, and national government through the YUS Conservation Area Management Committee (CAMC). The CAMC is responsible for long-term strategic planning and providing YUS landowners with strategic guidance, organizational and policy support for sustainable resource use. 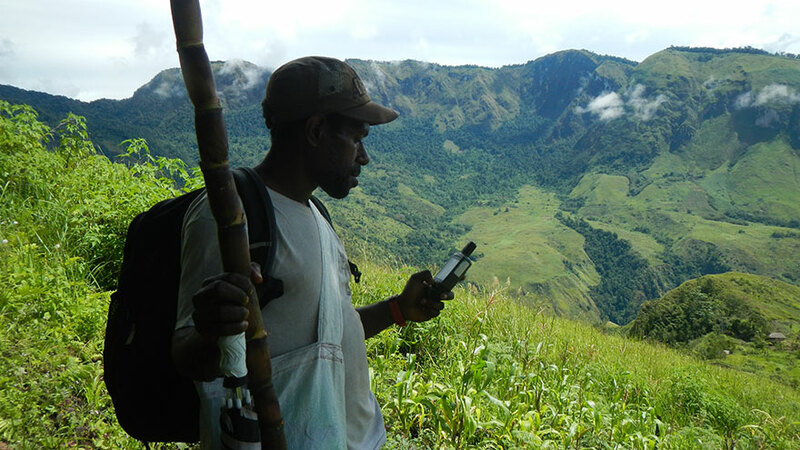 Another ‘first’ for Papua New Guinea, The YUS Conservation Area Ranger team is responsible for patrolling and monitoring wildlife inside and outside of the YUS Conservation Area. The Rangers are local landowners, nominated by their own communities to conduct patrols and evaluate the effectiveness of conservation efforts in YUS. 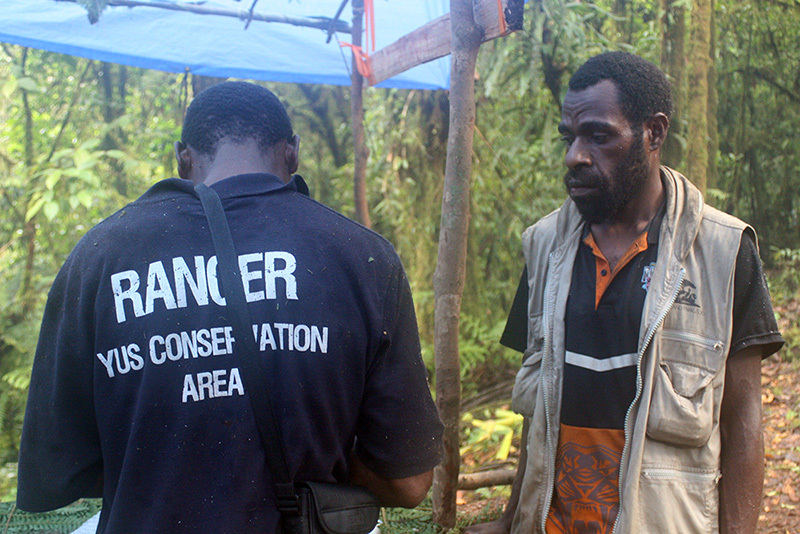 Rangers spend seven days each month patrolling segments of the rugged YUS Conservation Area terrain to record the presence or absence of several community-identified priority animal species which are threatened, and to check for potential violations of the mutually-agreed bylaws governing the YUS Conservation Area. The Rangers share their findings and observations with their communities to inform local resource use and conservation actions, and report to TKCP to guide the strategic management of the YUS Conservation Area. Potential violations are reported to landowners for resolution through the village court system. TKCP continues to strengthen the capacity of the YUS Rangers to conduct ecological monitoring, and plans to incorporate the use of Traditional Ecological Knowledge into monitoring patrols. To build a common understanding of the YUS Conservation Area’s boundaries and rules, TKCP continues to survey and map lands pledged by local landowners. Signboards are installed along primary walking tracks and access points to increase community awareness and reduce the incidence of illegal activities in the protected areas. In addition to mapping the YUS Conservation Area, TKCP team is mapping village land boundaries throughout YUS to prevent future disagreements and disputes. Over the course of ten years, more than 112,000 acres (45,000 hectares) of the rugged YUS landscape have been mapped by TKCP’s Mapping Team. For more information about our work managing the YUS Conservation Area, refer to the YUS Landscape Plan or our Annual Reports.